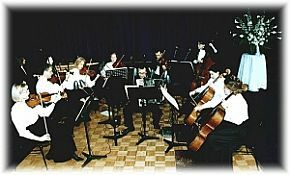 Sydney's Palm Court Orchestra was formed in 1974 to play the light music and popular classics of the Edwardian Era. Their vast repertoire in this genre includes ragtime, English and Continental waltzes, tunes from musical comedy, those cheeky, raggy arrangements of Tin Pan Alley songs and well known light classics such as those penned by Elgar, Dvorak, Rubinstein and Grieg amongst others. The orchestra has played very successful seasons at Sydney's Hilton Hotel, Melbourne's grand Windsor Hotel, at Pinetrees Lord Howe Island, and more recently at the sacred River Retreat, Bali, appeared as concert artists on the QE2, played for H.M. Queen Elizabeth on a number of occasions and for Prince Charles & Princess Anne and at the reception of Elton John's wedding. The P.C.O. has also accompanied silent movies, notably two Australian Classics, "For The Term Of His Natural Life" and more recently "Kid Stakes" and their faces and or music have been used in scenes in a number of Australian films and TV drama.